This has to be one of the coolest things any NHL team has ever done. Ever. Today, the Carolina Hurricanes announced they will play two games in 2018-19 as their predecessor, the Hartford Whalers — wearing those iconic green sweaters. The last time this jersey was seen on NHL ice was the 1991-92 season. For younger fans, the Whalers transferred to the NHL from the old WHA in 1979 and wore green and white jerseys with blue trim until 1992. They switched to blue jerseys and added silver to their color palette, but declining attendance led them to relocate to North Carolina in 1997. We’ll be able to watch the Whalers skate again when the Hurricanes face Hartford’s old rival, the Boston Bruins. The first game is just in time for Christmas on Sun., Dec. 23 in Raleigh. The other is late in the season on Tues., March 5 in Boston. The Bruins will wear white at home for that game. 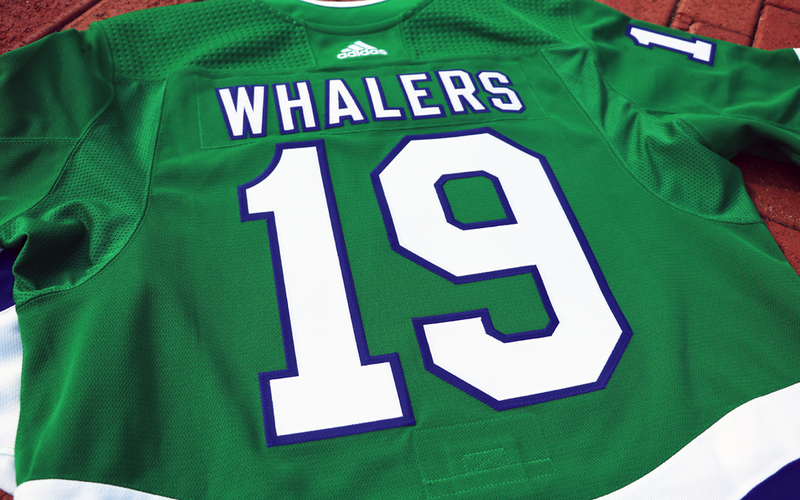 This new uniform is based the version of the Whalers jersey worn between 1985 and 1991 with angled sleeve stripes and without “Pucky” — the whale mascot — on the shoulders. But to ensure a connection to the present day Hurricanes franchise, the storm flag hanger effect seen in the team’s other jerseys is present here — in black and blue. 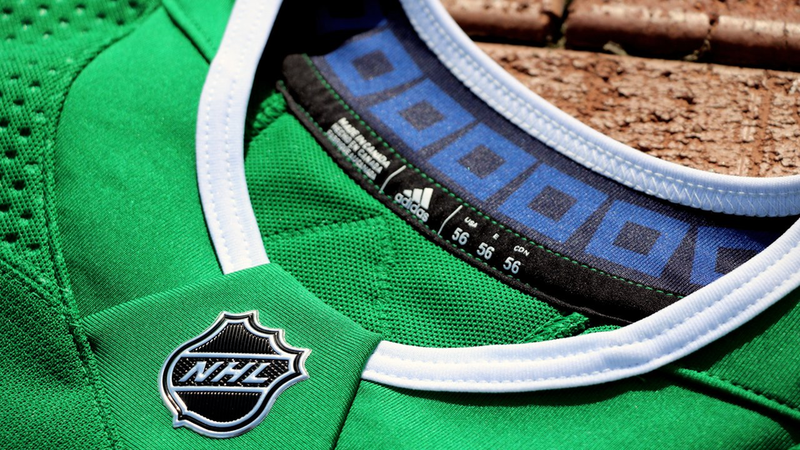 How amazing is it to see a Hartford Whalers jersey again? And so soon! I talked with Hurricanes VP of Marketing and Brand Strategy Mike Forman who told me the NHL and Adidas accommodated the team on an “expedited timeline” in order to make this jersey possible for 2018-19. Where there’s a will, there’s a way, right? As for whether the jersey will be seen beyond 2018-19, Forman said they haven’t decided yet. And naturally, where there are Whalers, there is the Brass Bonanza. The Hurricanes already started working it into some games last season, but you can absolutely bet on it for the big night in December! Before I wrap up, I have some more reading you might be interested in — old Icethetics articles that are suddenly relevant again. First, a Hartford TV station interviewed the designer of the original Whalers logo, Peter Good, in 2014. It’s a fascinating interview and fun to see some of his concept art. 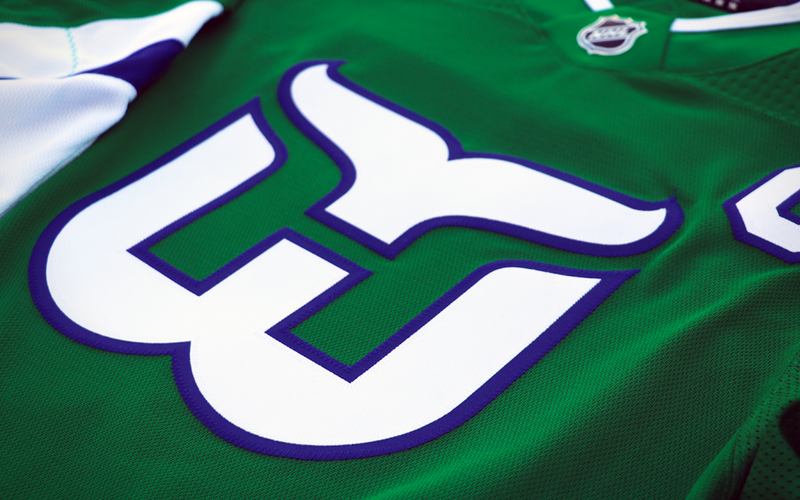 Then, read the story about how the Hurricanes logo came to be and how one designer tried to keep the Hartford Whalers spirit alive after the relocation. So how thrilled are you to see the Whalers (brief) return?